The talk gives an overview on how-to build an info sharing community based on cooperation between public and private sector. The focus is on the real challenges that companies are facing while trying to implement an effective threat intelligence platform based on info sharing principles and how to address these problems with open source software. • howto identify effective data sources. 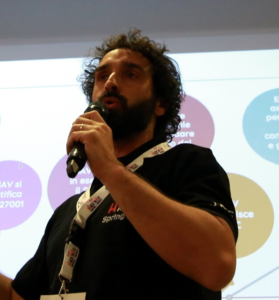 Giovanni Mellini leads the “Security of information, systems and networks” division in ENAV S.p.A., the italian Air Navigation Services Provider. Giovanni is responsible of Information Security Operation Center (i-SOC) operations and he always tries to figure out how to evolve the innovative model on which i-SOC is built; a model based on open source software and info sharing principle. He is now actively involved on threat intelligence and info sharing areas where he is trying to build an effective public/private community.